Our selection of hotels for clubbers that moves from high-end to mid-range to budget. If your stay on Ibiza revolves around the dancefloor, you want to book a hotel that caters to clubbers. No busy kids' pools, delivery and concierge services by Tweet or smart phone app and recovery breakfasts (or should that be dinners? ), plus juice and cocktail bars and spas in house. Our top picks range from the higher-end hotels to more affordable accomodation in the clubbing hot spots on the island. For a complete range of places to stay all across Ibiza, see our dedicated hotels section and find your perfect holiday pad. A cool rooftop bar with amazing views of San Antonio Bay and the Cuban style of Miami's buzzy Little Havana make the new Cubanito Ibiza Suites an exotic and stylish pick. Rooms have lots of retro features including radio-style Marshall speakers so you can make your own club soundtrack. Latin beats make the hotel's ambient sound a nice getaway from high BPMs when you need it. Just moments from Cala Gració beach with comfort and amazing service - it's all here. A four-star hotel that is all about music. 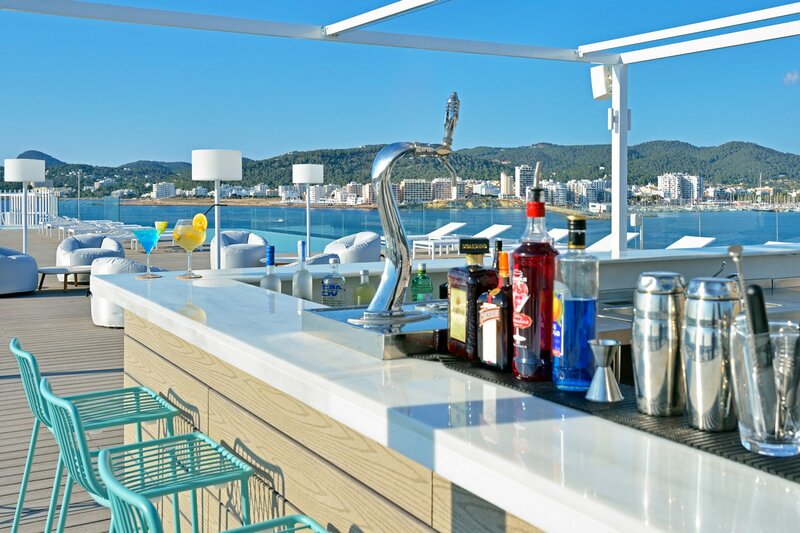 Sol House Ibiza has regular DJ sessions throughout the summer on its decked-out roof terrace and is located right on the beach in San Antonio Bay. You can sleep all day, eat at the Food Factory restaurant where breakfast is served anytime and be ready to recharge your batteries as you watch the sunset from your room. It's a hip pick and pet friendly to boot! A rocking set of apartments with incredible San Antonio Bay and sunset views is what you get at the Marina Playa. You can enjoy some great live DJs on the chill-out terrace as you recline on a lovely big Balinese bed. There's a regular weekly programme of parties and events to get you in the party mood too. Remember to try one of its excellent cocktails or dip downstairs to its stylish new bar, Toro before you head out. Right in the epicentre of Playa d'en Bossa is the Jet Apartments' complex, tailor-made for party people. With the Jet's daily pool parties and numerous bars, you can have a right old warm up before setting out to boogie till dawn, then come back, sleep and recover on one of the sun terraces or by the beach bar. The ideal pre- and post-party pad for groups and couples. Flamingos, cocktails and fun in the sun best describes the super-cool adults-only Tropicana Ibiza Suites set in a secluded part of Playa d'en Bossa. This colourful art-deco hotel features a "Blue Parrot" suite and a "Cocktail & Dreams" bar - a perfect spot for the day after or to get warmed up for a big night by taking a dip in the pool and enjoying one of their resident DJs Latin disco or cool cocktail lounge sets. Whilst founder Tony Pike is no longer with us, his legend lives on in the Pikes Hotel in San Antonio. Once the bolt hole for celebrities like Freddie Mercury and George Michael, the hotel has had a recent refurbishment, adding healthy recovery food and drinks and amazing Sunday lunches. Worry not as the pool and bar that featured in Club Tropicana are still there. It also hosts its own club nights too so you only have to stumble downstairs to have a fabulous night out! Last year's Ibiza Instagram hotel sensation, the new Paradiso Ibiza Art Hotel in San Antonio Bay has proved very popular. Art is a big feature, with all rooms featuring a unique artwork. Add to that a profusion of pastel pinks in the cool ‘70s revival style suites, a pink-tiled pool and a glass-walled room in the lobby where you can be part of a live art installation and it adds up to art-tastic. What clubbers' holiday would be complete without throwing some shapes on the dancefloor of this giant? With a choice of two complexes at the Ushuaïa Ibiza Beach Hotel, you can have a balcony literally overlooking the dancefloor. The quirkier and quieter Tower offers a VIP service so you can recover by the pool without lifting a finger. Discreet staff and big name DJs are regulars here and you are surrounded by some uber cool design too. This sea-side stunner has a cool pool with views and easy access to Playa d'en Bossa beach and views out over the sea. The Santos Ibiza Suites are right in the middle of the action so you can walk to super-clubs like Hï and Ushuaïa or recover from a big night out with service to your room or pool side. They do fabulous cocktails for the pre-party and healthy smoothies for reloading before you do it all over again. Destino caters for the cocktail-sipping, exclusively adult crowd - the Pacha-owned venue oozes glamour from the moment you walk in the door. Located in Talamanca, you are in easy reach of Pacha and Heart, as well as some of the trendy DJ bars like IT Ibiza in Marina Botafoch. It's easy to be seduced by the views as you recharge your batteries and there are regular club nights on as well. The pocket-friendly azuLine Hotel Galfi in San Antonio is 18+ and is steps away from all the action of the West End. Ibiza Rocks is near and it's a short walk to clubs like Es Paradis and Eden - or for clubs further afield, there's always the famous Discobus. Different from many of its neighbours, it's got old-world Spanish charm and pool that offers shady spots to relax and recover after a big night out. With fantastic art-deco style, Es Vive is ideal for clubbers who want a bit of pampering but still want to be very close to Figueretas and Playa d'en Bossa. It's popular with trendy island visitors and the gay crowd alike. It's got a terrific bar and has a ground floor pool area with extremely attentive staff as well as a roof terrace that's perfect for pre-clubbing drinks.